All right, peeps, here’s a scenario for you. Imagine a beautiful, bustling village, famous and popular for miles around. Now imagine two factions of that village falling out with each other and, under the auspices of two separate councils, that spat leading to the village splitting in two. And now imagine that split intensifying to such a degree that a concrete wall is erected by one half of the village so its people won’t – because they won’t be able to – move freely into the other half; splitting up friends and families in the process. And, finally, imagine the situation getting so out of control that those who try to go over the wall are shot on sight by the village’s half that built it. Now, meine freunde, expand that little scenario to an entire city; indeed a fascinating, brilliant, major capital city of around 3.5 million people. For this was exactly the reality faced by Berlin for 28 long years from when the infamous Berlin Wall was erected on August 13 1961 until it finally started to ‘fall’ on November 9 1989. The Berlin Wall is undoubtedly one of the most obvious and potent icons of the Cold War – after all, it was effectively a physical manifestation of that espionage- and nuclear arms race-fueled four-and-a-bit-decades of tension between the Soviet Union and the West (led by the United States). Built by the USSR-overseen East German authorities to prevent the mass exodus that was threatening to deplete not just East Berlin’s but East Germany’s population (especially intelligent, well educated young people; i.e. the ‘Brain Drain’), it ensured that the West and East halves of the city were properly cut off. Berlin – already loosely split into four sectors controlled by the four major allied victors of World War Two, the US, UK, France (West) and the USSR (East), following the surrender of the Nazis at the war’s end in 1945 – was itself already cut off from the rest of the ‘Western allies-controlled’ West Germany, lying as it did in the heart of the ‘USSR-controlled’ East Germany. This then is the background to the one of the greatest speeches of the 20th Century, nay, of all time, delivered 50 years ago today by US President of the day, the King Arthur of the Camelot that was his White House, John F Kennedy. Kennedy was a Democrat; a genuine progressive, reforming Democrat at that, at least when it came to domestic policy. And when it came to foreign policy, he had his detractors (mostly on the Right), whom believed after the ‘reds under the beds’ era of the Eisenhower/ McCarthyism ’50s, he was soft on Communism; soft on the Soviet Union. Just two weeks before this speech he’d suggested that ‘improving relations with the Soviet Union’ ought to be made, so the strong, steadfast, if you will, intellectually combative content and tone of the speech he made on June 26 1963 was something of a surprise. He was manning-up when it came to the Soviets and the Communism; he was making a stand and showing where he stood – where the vast majority of Americans and peeps across the Western world stood – when it came to the ever worsening Cold War. What made the speech so significant is arguably two-fold. First, its quality. 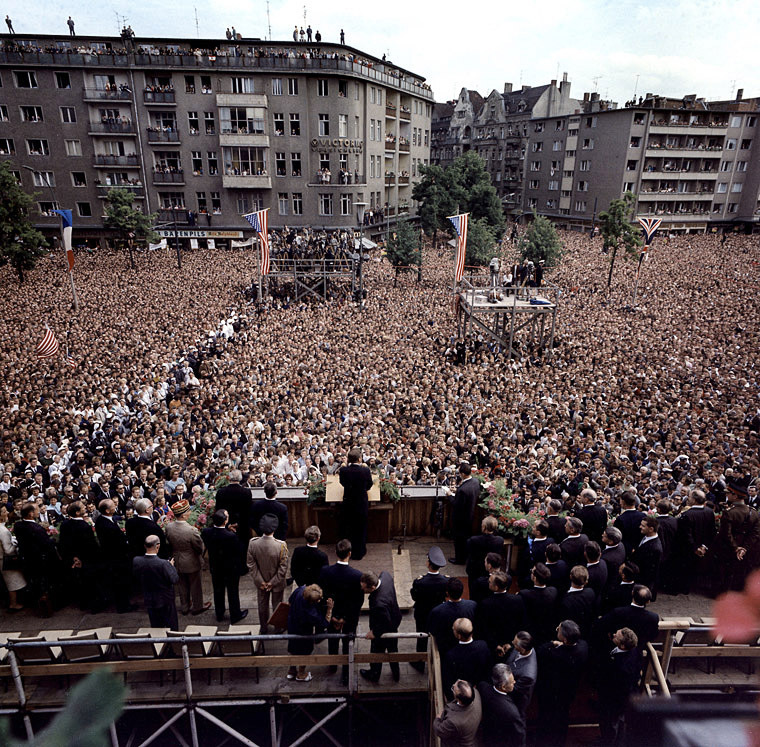 Unequivocably, but utterly eloquently, it outlined how as unofficial ‘leader of the free world’ he and his administration were committed not just to opposing the values and actions of the Communist regime of the USSR, but also were committed to supporting, defending and standing by the isolated West Berliners (owing to its unique situation, Berlin was obviously the ‘frontline’ of the Cold War). Its theme of the inexorable desire for and necessity to defend liberty can simply never be dismissed and, not least because of the quality of the speech, is utterly laudable; it’s not twee, because history teaches us of freedom’s fragility. Its phraseology, though, is what makes it unforgettable and brilliant. 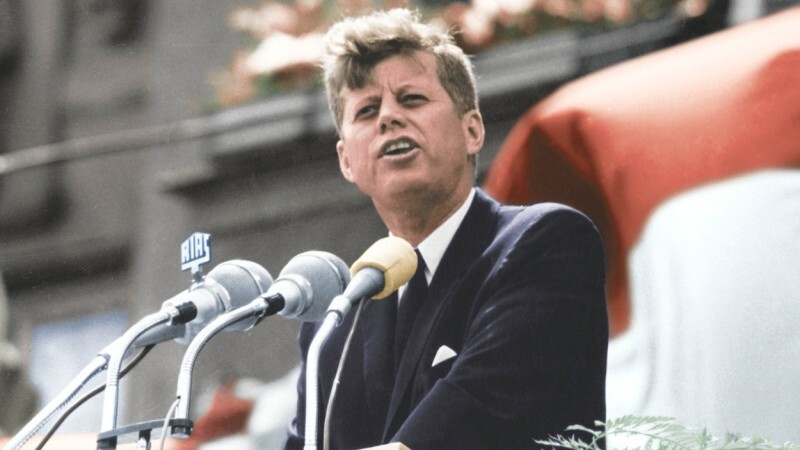 The utterance of ‘Ich bin ein Berliner‘ coming from the mouth of the US President is an impossible-to-misunderstand exclamation of solidarity (not to be misconceived as Kennedy claiming he’s a jelly doughnut; although admittedly that’s always been amusing) and it’s four-times repeated suggestion that those who doubt the threat of Communism ought to ‘come to Berlin’ (Lass’ sic nach Berlin kommen) to observe the stark reality are the stuff of genius speech-writing from the great Ted Sorenson, author (in part) of the thing and chief scribe of most of Kennedy’s speeches. The second point of the speech that made it so significant was where it was delivered – West Berlin itself. In fact, in front of the Rathaus Schöneberg, the de facto city hall of West Berlin. Making such utterances in the speech as he did and delivering them in the heart of the city itself had a profound effect, don’t doubt it; not least because a staggering 45,000 citizens turned out to witness the visit of this megastar of world politics and hear what he might say in support of them and their city. As you may well know, to mark the speech’s 50th anniversary, present US President Barack Obama travelled to Berlin and made another well attended speech (if one with quite a different theme) and the historians among you will be only too aware then American Prez Ronald Reagan almost repeated Kennedy’s feat when he delivered a powerful message in a speech outside the Brandenburg Gate on June 12 1987 (‘Mr Gorbachev, tear down this wall‘). Yet, for its geo-political, historical context, its brilliance and the fact it got there first, Kennedy’s speech of June 26 1953 is the daddy. Curiously, his National Security Adviser George McBundy actually felt he’d gone too far, been too provocative, so the speech’s language was slightly toned down when Kennedy repeated it at Berlin’s Free University the same day. Certainly few others in the Western world felt that way – and surely very few around the world today do either. I am proud to come to this city as the guest of your distinguished Mayor, who has symbolised throughout the world the fighting spirit of West Berlin. And I am proud to visit the Federal Republic with your distinguished Chancellor who for so many years has committed Germany to democracy and freedom and progress, and to come here in the company of my fellow American, General Clay, who has been in this city during its great moments of crisis and will come again if ever needed. Two thousand years ago the proudest boast was ‘civis Romanus sum’. Today, in the world of freedom, the proudest boast is ‘Ich bin ein Berliner’. There are many people in the world who really don’t understand – or say they don’t – want is the great issue between the free world and the Communist world. Let them come to Berlin. There are some who say that communism is the wave of the future. Let them come to Berlin. And there are some who say in Europe and elsewhere we can work with the Communists. Let them come to Berlin. And there are even a few who say that it is true that communism is an evil system, but it permits us to make economic progress. Lass’ sic nach Berlin kommen. Let them come to Berlin. Freedom has many difficulties and democracy is not perfect, but we have never had to put a wall up to keep our people in, to prevent them from leaving us. I want to say, on behalf of my countrymen, who live many miles away on the other side of the Atlantic, who are far distant from you, that they take the greatest pride that they have been able to share with you, even from a distance, the story of the last 18 years. I know of no town, no city, that has been besieged for 18 years that still lives with the vitality and the force, and the hope and the determination of the city of West Berlin. While the wall is the most obvious and vivid demonstration of the failures of the Communist system, for all the world to see, we take no satisfaction in it, for it is, as your Mayor has said, an offense not only against history but an offence against humanity, separating families, dividing husbands and wives and brothers and sisters, and dividing a people who wish to be joined together. All free men, wherever they may live, are citizens of Berlin, and, therefore, as a free man, I take pride in the words ‘Ich bin ein Berliner!’. Reading that speech through makes me realise that man is capable of rising above the perceived narrow minded view of many societies and there political systems and to fight for what is truely right. As long as this is so them there is hope for, man, the planet and life. Yep, it was a great speech, indeed. I suppose you could say it was only a speech, though. Yet writing the post made me think just how big, how world-changing and how profound an achievement the fall of the Berlin Wall was 26 years later. That was the realisation of that speech – and few great, idealistic speeches have such realisations. “Lass sie nach Berlin kommen” – Berlin 2012 takes a proactive lead! | We dream of things that never were and say: "Why not?"